NEW DELHI—Eight months after a historic victory in the national elections, India’s Prime Minister Narendra Modi’s party faced its most embarrassing defeat in recent times. The Bharatiya Janata Party (BJP) lost by a landslide to anti-corruption crusader and a new entrant to Indian politics, Arvind Khejriwal, in the Delhi elections. 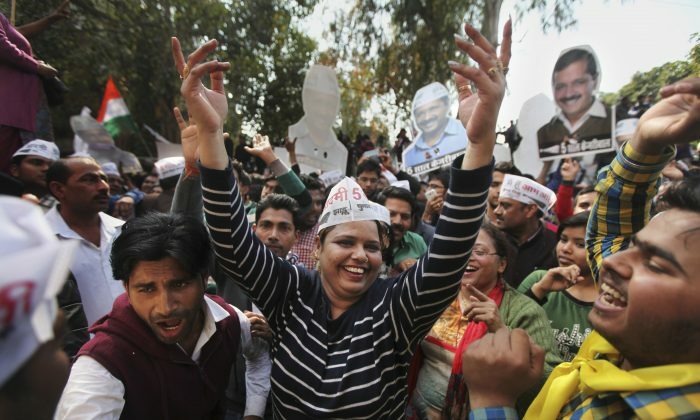 Barely two years old, Khejriwal’s Aam Admi Party, or the Common People’s Party, won 67 out of 70 seats in the Delhi assembly on Tuesday. It’s set to form the new government on Saturday. According to Mishra, sixty percent of the people in Delhi are common people, and Kejriwal reached out to them with promises of cheaper electricity and free water. Kejriwal, a former tax officer who rose to the limelight as an anti-corruption crusader, served as Delhi’s chief minister for 49 days exactly a year ago. He resigned frustrated by obstacles faced in the way of an anti-corruption bill. Another political analyst, Sunil Kumar Chaudhary, who is also a professor at the Department of Political Science at Delhi University, said the election results highlight the new emerging politics of popularism and freebies in India. “My students are very excited about Aam Admi Party’s promise of free Wi-Fi around Delhi. Imagine having surveillance cameras in every nook and cranny of Delhi,” he said. The Common People’s Party in its manifesto has promised one million CCTV surveillance cameras for women’s security around the state. Chaudhary however thinks that this embarrassing defeat is an organizational failure for BJP and is no threat to Modi’s national government. “People see Modi as a national leader and Khejriwal as a local (Delhi) leader,” Chaudhary said. People see Modi as a national leader and Khejriwal as a local [Delhi] leader. BJP, which in last year’s national elections won all seven parliamentary seats in Delhi, was not expected to lose so badly according to all the pre-election polls. Mishra says Modi needs to take stock and work on collective politics. On Tuesday morning Modi called Khejriwal to congratulate him on his party’s victory and invited him for Chai-pe-charcha (discussion over tea). Chai pe charcha was a popular during Modi’s national election campaign, where he connected with the common people sitting across India. It later became a symbol of Modi’s popularism. “This (elections) could change the political culture. Kejriwal however can be seen as a strong political opponent against Modi only when he’s able to deliver. We’ll be able to judge him only after two years of his work,” said Mishra. China’s press has sought to downplay a U.S.-India summit that saw the two giants unite in measures opposing China. Sri Lankan president Maithripala Sirisena is repairing his country's relations with India, to the dislike of the Chinese regime.